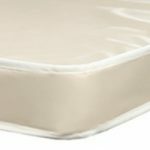 The Vinyl & Smooth Top Collection is the first item on the list of mattresses posted on the Spring Time Bedding (SBT) website. It has only three models, Vinyl Spring103, Vinyl Goam105 and Smooth Top172. The name of the collection is taken from the names of these models. Some of the features are immediately apparent, and some features have to be discerned, partly from photos and partly by comparison with other Spring Time products. This company does not really describe their items individually, and recycles the same copy for several items. The covers of at least the first two models are vinyl. This is a waterproof material which is easily cleanable. From the description, these are evidently intended for use by children, though guests are also considered, making vinyl a natural choice, especially for children who do not alway get up when they should during the night. 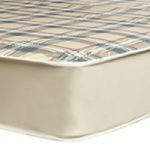 The top panel of the Smooth Top172 appears to be woven, and could be a moisture-resistant fabric such as high-denier nylon. According to SBT, the padding is non-recycled material. Exactly what this material is they do not say. I'm assuming that these are specialty sleep mattresses, since there is no mention of springs of any kind. This could be a single bock of polyurethane foam. However I am not ruling out two or three layers of foam. With the emphasis on "non-recycled material," this could be pieces of foam (there are a few mattresses filled with that), but I won't stake a claim on that. 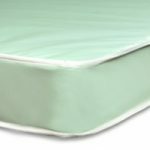 All Vinyl & Smooth Top mattresses are listed a 8" high. The wood-framed platform box foundations are 7" high for standard and 5" for low profile. The warranty is for 5 years, reinforcing my opinion that the covers are vinyl.